Disney has unleashed a second trailer for the highly anticipated sequel to 2012's Wreck-It Ralph subtitled Ralph Breaks the Internet. While Ralph was always one of those movies that seemed ripe for a sequel I've re-watched that original quite frequently as of late given my three-year-old had that stretch where it was the one movie she liked to watch again and again and I couldn't help but to wonder how they might credibly follow the film up given the first ends with everything seeming to be set-up so nicely. Of course, I was only more nervous after the title of the film was revealed even if that initial teaser trailer made the premise look a bit more promising and naturally intriguing. With this full, theatrical trailer though-I'm totally in the bag for this thing. Sure, it looks more like The Emoji Movie given all the product placements and timely jokes/references than I would have ever imagined, but there's seemingly no chance Directors Rich Moore and Phil Johnston's sequel will measure up to that ungodly travesty that tried to capitalize on both a hot cultural and cinematic trend and just didn't work at all. 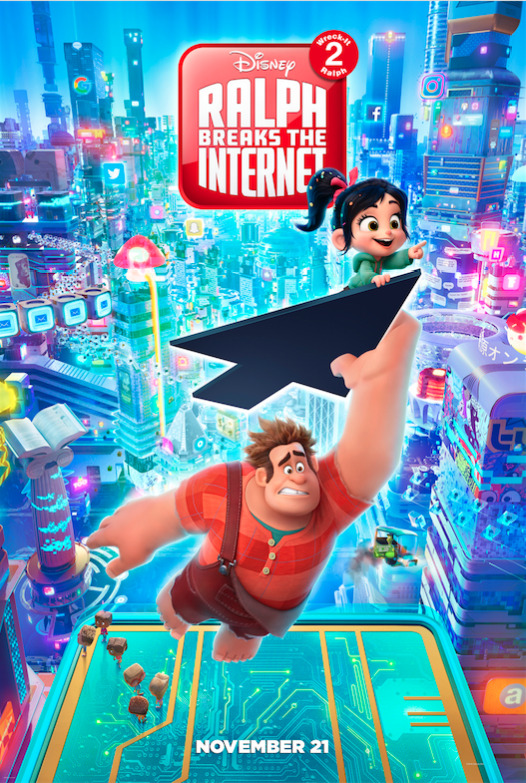 In Ralph Breaks the Internet, John C. Reilly's titular character and Sarah Silverman's now Princess Vanellope must head to the Internet in order to find a replacement part to save Vanellope’s game. Yes, there are nods to Amazon, Google, Twitter, and such aplenty, but what is kind of surprising but shouldn't be is how much Disney is both tooting its own horn and utilizing everything under its umbrella at the same time. There is blatant Star Wars and Marvel name-dropping, of course, but Disney also draws from its own catalogue as a scene feature the mouse house's cavalcade of princesses is sure to be what people remember from the trailer and look forward to in the finished film. Wreck-It Ralph 2: Ralph Breaks the Internet also stars Taraji P. Henson, Jack McBrayer, Jane Lynch, Alan Tudyk, and opens on November 21st, 2018. Synopsis: “Ralph Breaks the Internet: Wreck-It Ralph 2” leaves Litwak’s video arcade behind, venturing into the uncharted, expansive and thrilling world of the internet—which may or may not survive Ralph’s wrecking. Video game bad guy Ralph (voice of John C. Reilly) and fellow misfit Vanellope von Schweetz (voice of Sarah Silverman) must risk it all by traveling to the world wide web in search of a replacement part to save Vanellope’s video game, Sugar Rush. In way over their heads, Ralph and Vanellope rely on the citizens of the internet—the netizens—to help navigate their way, including a webite entrepreneur named Yesss (voice of Taraji P. Henson), who is the head algorithm and the heart and soul of trend-making site “BuzzzTube.” Directed by Rich Moore (“Zootopia,” “Wreck-It Ralph”) and Phil Johnston (co-writer “Wreck-It Ralph,” “Cedar Rapids,” co-writer “Zootopia,”), and produced by Clark Spencer (“Zootopia,” “Wreck-It Ralph,” “Bolt”), “Ralph Breaks the Internet: Wreck-Ralph 2” hits theaters on Nov. 21, 2018.